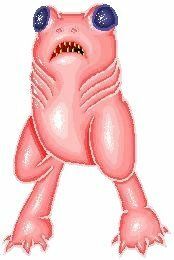 An illustration posted by user Kryptid in the Wikipedia website in 2006 in the article about the Canvey Island 'monsters.' The illustration is based on the description of the monster given in Frank Edwards' 1959 book Stranger Than Science. This copy of the illustration is from the Wikipedia website [Link Here].